The best areas top out at 2 to 5 feet, like a hump that is shoreline connected or a hump that is within real close vicinity of the shore. Another thing to look for is any shoreline spawning area with a 2 to 5 foot drop onto a shelf. Unfortunately, because the water is really cold, most people automatically think that they have to jig these areas slowly. The #5 Berkley Flicker Minnow is also a good choice for casting, as it dives quickly and has more of a minnow type profile as compared to a shad style bait. 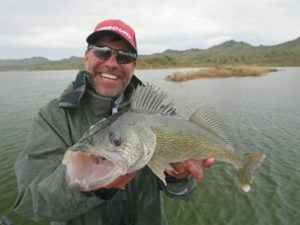 The #5 refers to the length of the bait, so at 5 cm, this bait is a great size for early season walleyes that are relating to the newly hatched bait. By alternating between the shad style and minnow style bait you should be able to dial in the cranking presentation. Boat speed and water temperature are key. When the water temperatures are still in the 30’s and 40’s the fish tend to prefer cranks that are 9 cm-13 cm long over nightcrawler harnesses. Once again, slow and subtle is key. You aren’t going to be trolling at 2.5 mph! We typically like to troll anywhere between 1 and 1.5mph. Historically, minnow shaped baits with a more subtle action have been best. Once water temperatures reach about 50 degrees, a mix of harnesses and cranks are often used. When the water crosses 55 degrees, a lot of anglers like to stick with harnesses, but cranks are always a player. This is why we spent three years perfecting the big Berkley Flicker Minnows. The #9 and #11 sizes were made for trolling in both cold and warm water. The action of the lure changes slightly with the speed of your boat. When trolling at slower speeds it has more of a roll. 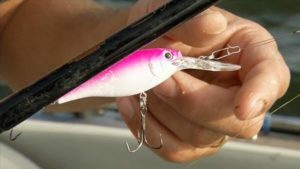 At higher speeds it has a little bit of a “kick.” These changes in action make this a very versatile lure! Let’s say you were going to run one of the new #11 Flicker Minnows and wanted it to go 18 feet deep using 10# Berkley XT line, which is the most commonly used trolling line. On the app you would simply bring up the #11 Berkley Flicker Minnow, dial the first wheel (Feet Down wheel) to 18, and the app would tell you to let out 95 feet of line. Then let out that length of line and you can be confident your bait is running 18 feet down, just above those big arches 20 feet down on the graph.